Born in the small city of Thal, Austria, in 1947, Arnold Schwarzenegger moved to Los Angeles at the age of 21. Within 10 years, he was a millionaire businessman. After 20 years, he was the world's biggest movie star. In 2003, he was elected governor of California and became a household name around the world. ©2012 Fitness Publications, Inc (P)2012 Simon & Schuster, Inc. 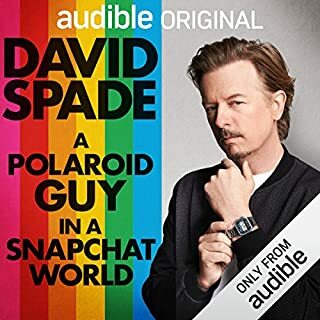 I must have picked this audible book up on sale. The life of Arnold never was an inspiration to me. When I started listening my plan was to skip over the bodybuilding part. Who knew that this would be fascinating and the entire autobiography would be such a pleasant inspiring read. Schwarzenegger has accomplished a lot in life and his formula for success in the three diverse fields of bodybuilding, acting and politics is worth hearing about. Although there are probably some distortions in his account, enough of the measure of the man comes through that demands your respect. I am not a Republican by nature but would be happy with Arnold as a leader because he knows the value of compromise and he thinks independently and does not blindly follow an entire ideology. Whatever your political inclination is - you have to admire this man who always got results. Arnold's Bio~ This starts with his life as a boy in Austria with a less than close relationship with his father. His drive to get ahead by body building which takes him by storm as a teenager. While other boys had girl pin ups Arnold has american body builds in his room leading his mother to worry about his sexuality. His "goal" was to become a body builder and win the biggest titles using this to gain wealth and move to the USA and become a movie star. His very intelligent approach to business and his amazing ability to FOCUS. As his body becomes huge he wins several World Titles and he ends up in LA at the Gold Gym he read about in his teens. He sets up a mail order business selling body building phamplets His first efforts in the movies was PUMPING IRON which caught the attention of the Hollywood crowd. He becomes a millionaire and invested in buildings and land. He gets an education taking business courses. He became an American Citizen. At a fund raiser he comes in contact with the lovely Maria Shriver. He evenutally marries. His movie career takes off to make him the highest paid and biggest box office star. Arnold makes his own decisions even after he is married. He decided not to tell Maria he needed open heart surgery. He was planning on running on the republican ticket for Governor of California and told Maria only *days* before his David Letterman annoucement. Arnold is at best brilliant but perhaps is the worlds great salesman. He can sell himself in bodybuilding, acting, and republican governor in a very democratic state. He finally confessed a life changing "secret" the day after was no longer governor. He has a 14 year old son with his housekeeper. He stated he only suspected the boy was his after the boy was 7. Arnold has a trick he uses throughout his book. His ablity to ignore anything that would cause him trouble. He puts in a "compartment" in his mind and trys his best to keep it "under raps". Arnold comes across as a very intelligent and interesting man. His EGO is as big as he is. We see the flaws in this bigger than life man and his secrets that help destroy his marriage. Arnold at best is a survivor. 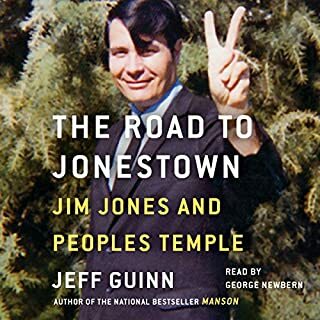 This is an excellent audiobook. It is very well written and the story flows along. The Reader Stephen Lang is very good and Arnold reads parts himself. I give this 5 STARS over all for a better than I ever expected Bio. Read by the author, my eye! This is a wonderful telling of Arnold Schwarzenegger's life. 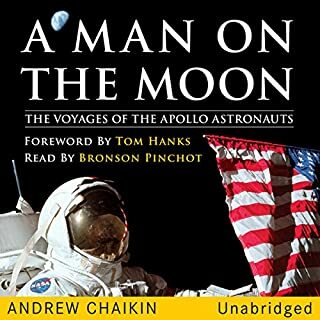 I say telling because while the audio book is advertised as 'read by the author', in fact, Stephen Lang reads all but two chapters. I would have preferred to hear the story in the author's words. The details are very well presented and the listener gets a real insight into the life of Mr Schwarzenegger. Agree with him or not, it is a very interesting story about a very eventful life. I enjoyed the story greatly. 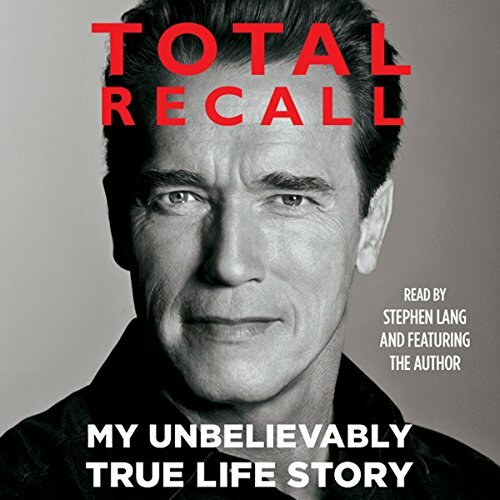 Would you consider the audio edition of Total Recall to be better than the print version? There were quite a few throughout the book. I don't know much about american politics but quite enjoyed his account of his years spent as governor. Also enjoyed how he talked about body building and the physical requirements. There are a few funny stories too! Which character – as performed by Stephen Lang and Arnold Schwarzenegger – was your favorite? It was impossible to stop listening. His story is simply awesome. His bodybuilding years were great. What about Stephen Lang and Arnold Schwarzenegger ’s performance did you like? It really did not feel like i was listening to someone else than Arnold. His tone was great. The Authornator hits a home run! Although this book follows the life of this amazing person, it's much more, it explains why Arnold made all of the major decisions in his life. He is extremely fair pointing out all of the both his bad points as well as the good. Here is a man who came to the United States with next to nothing and became a successful business person, the world's best bodybuilder, one of the world's top grossing actor, led the nation in a push for physical fitness and became the governor of California. He has mingled with Presidents, business giants and celebrities and yet in his mind he is still a regular guy who just worked extremely hard and did well. It's truely the best example of the American dream. You can't listen to this book and not be motivated. Arnold did more than say that the United States of America was the greatest country in the world he proved it. What does Stephen Lang and Arnold Schwarzenegger bring to the story that you wouldn’t experience if you just read the book? The book is read by both Arnold and Steven Lang. It's a great mixture. It's great to hear Arnold tell his story and Lang jumps in for the bulk of the book. I was so impressed with a young Arnold buying an apartment building when most everyone else would have waited until they were better suited. He did plenty of research and began his empire when the rest of us would have still been dreaming. He is a man of action and this more than all of his other accomplishments demonstates this fact. As Arnold indicates, don't copy all of his actions, learn from his example and improve your life and the lives of those around you. He gave up countless millions to be governor of California so he can give back to the country that allowed him to be such a success, we can all learn from his example. Arnold Schwarzenegger is a prime example of someone whose focus and determination set him apart from other people. Athlete, businessman, actor, public servant, philanthropist...the list goes on and on. He embodies so many qualities that I find admirable. I grew up watching his celebrity rise through movies and then peak as governor of California. I always wondered what kind of man could go to a foreign country without speaking the language and become so successful. The book provided insight into his motivations, ambition and intelligence. I found his life story fascinating, although I think there were times he did not give us the whole story. Some may fault him for his foibles and peccadilloes, but who among us is perfect in thought and deed? In fact, I believe his weaknesses make him easier to relate to. I highly recommend this autobiography from a truly exceptional modern renaissance man. 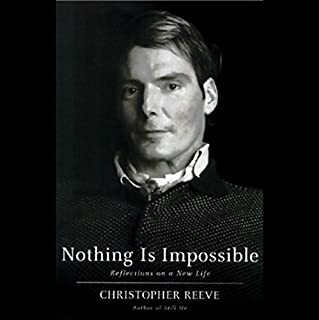 The title "My Unbelievably True Life Story" needs to accent the 'unbelievably" part more - his story, success and adventures were an amazing listen. Yes we knew the end result of his recent marital issues, but little did i know about his path and efforts to success. I have told so many people about this book as i progressed and encouraged many to listen as well. His centrist political views are, in my opinion, a majority of the nation and he would be successful again in politics if he tried. Grew to respect the Governator more. Great story, well written, but it loses a lot since Arnold reads only a small piece of it by himself. Really disappointing. With another person's voice, it felt strange - not really false, but not as true as when Arnold reads his chapter. This is such a well told story of a remarkable mans life, so much so that I have thoroughly annoyed my friends and family going on about it. I bought it for fun really thinking that Arnold hasn't released anything before really so it would be interesting, but it's so much more. From the start you know this is going to be a tale of rags to riches but throughout all of it you cant help but admire everything about him, from his determination to succeed in life and break the mould, to his gentle nature and just the way he speaks about everything as 'matter of fact' and at no point does he get bitter about events in his life or adopt the 'Woe is me' view which so many of our modern day celebrities do. This was a real eye opener to me and an inspiration, and I believe that no matter who you and what you think of him, everyone should listen to the last chapter titled 'Arnold's Rules' (narrated by arnold himself). It puts a lot of so called motivational speakers and life coaches to shame and is something I have listened to on it's own several times. I thoroughly enjoyed this and would recommend it to anyone, safe in the knowledge that they will take away something positive with them. Fear not, Arnie does not read all of it. I was worried that he would read the whole book. Thankfully Stephen Lang was hired to finish the job. Arnie’s style of narrating just didn’t sound right to me and made for difficult listening. Over all it was a good insight to the man. I do think it is maybe part of a PR campaign to recover his image. The other thing which stuck out was the references to his 'amazing wife'. Just seemed like this book was a way of sucking up to her to get her back. Over all a great read. Honestly is the best biography / memoir of any celebrity I have listened to. Whilst most characters (who admittedly also have interesting stories) simply have only one profession and thus can get fairly dull or tedious, Arnold's unlikely transition from bodybuilder to actor to Govenor combined with his incredible drive and work ethic makes the story fresh and intensely gripping. His ideology and backstory is one of the most inspiring to date and his name will surely go down in the record books for all he has, and surely will still to come, accomplish. 5/5 I highly recommend this to all members of the public, regardless of sporting interest or political inclination. If you are interesting as to what makes someone successful then here is one of the greatest examples. When you consider he knew no one when he got to America with limited English and a basic education Arnie became one of the greatest, certainly the most famous bodybuilders of all time. He then went on to be one of the highest paid actors of all time and then governor of California not once but twice. The remarkable thing is that he doesn’t think of himself as remarkable he just wanted it and did what was needed to get it, without fear. Arnold talks a lot about his body building, his tournament wins and his drive to achieve this success. He speaks of his movie roles, his political career and the son he had with his house maid. Once I finished this listen I concluded that I sincerely hope he and Maria Shriver stay together. He clearly adores her and has suffered a great deal as a result of his selfish actions. You will hear Arnold himself speak at the start and again at the end. The speaker in the midst is good to listen to. I enjoyed this autobiography very much indeed. He is a human being rather than the Terminator. This book gives him a humane quality easy to understand and empathise with. 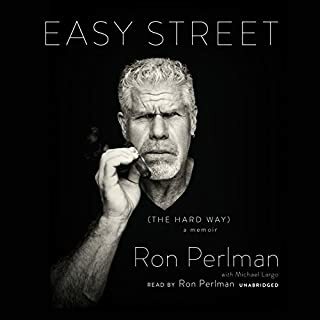 If you like self help books this would be a good listen to see how those skills you read about are put into practice and he sums them up himself at the end. The first and last chapters are read by Arnold himself, however the rest is by another narrator. Although the story is brilliant, the bits Arnold reads himself seem to add so much more to the book and to the experience. It took my at least 2 chapters to get used to the new narrator and for this reason alone I can only give it 4 stars. Had either Arnold or the other narrator read the whole thing in its entirety then I imagine I'd have awarded 5 stars. The story and the stories are epicly good and all things considered I thoroughly enjoyed this book and will listen to it again one day. A very accurate events of the authors life. The book goes into great detail about all aspects of Schwarzenegger's life from his early childhood back home in Austria to his multi million dollar movies to his body building. The man has clearly led a packed life, full of exciting and interesting moments. He really goes into detail about his days bodybuilding and his movies, his lie life ad marriage break down. I would really recommend this book to any fan of his movies as it allows you to understand the man behind the characters. Well, his life story is quite something. But in the end I got bored by the great 'I am' that comes with such a successful life. The book does go on and on. So you have to be a real Arnold fan to wade through this. His early life is the most interesting part, after that it is all predictable. If this book doesn't motivate you in any way then there is something wrong with you! To think he came from such poverty to then become Governor of California is unbelievable! Well worth the read! Only criticism, as good as the other voice was, it would have been nice to have had more of Arnie speaking. i thought this was an outstanding book that does tell an unbelievable story. Although heavily sanitized I definitely got something out of it. Stay hungry! Arnold's life story is an inspiration and hugely motivating. Could not atop listening, well read and fascinating. I highly recommend anyone interested in self improvement or great stories to purchase this book. Nicely written and inspiring. This book allows you to see the path to Arnold's success, not just the end result(the guy he is now). Life that clearly follows principles of other successful people. Always have the best mentors you can find, have a vision, written goals with measurable objectives, learn to sell, learn from your mistakes, reps/reps/reps(practice makes perfect). Arnold walks us through his whole life in a really simple way and tells us all about the incredible journey he takes. Personal drive is a massive understatement. Arnold's story, told warts and all would inspire anyone to set higher goals, work harder and enjoy life more. Reps, reps, reps. Weights, study, rehearsing for speech. Hard repetitive work working towards your vision until you achieve it. The world is a better place with Arnold Schwarzenegger in it. Thank you so much for sharing your story with us. Arnold's story is just completely insane. I got captivated, inspired and wildly amazed by the incredible things this man had been able to achieve in ONE lifetime. Thank you SO much arnie. You are a role model! I would have probably enjoyed it more had the author narrated the entire book rather than just the first and last chapters. 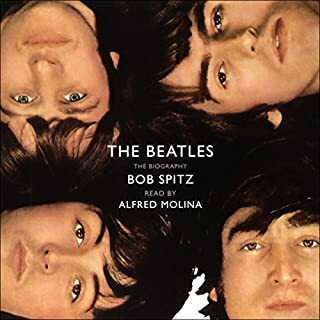 A rather candid look at himself if not a bit jumbled chronologically and thematically but still well worth the listen. my only issue is it would have been nice to have more of Arnold reading it.